What brings together all the members of the Justice League more than anything else? Why, throwing the best party, of course. 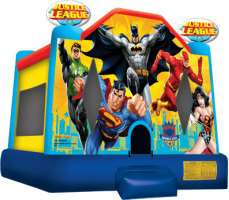 The Justice League bounce house is one of our commercial grade inflatable bouncers that is sure to bring excitement to your party. Watch as everyone takes up the persona of their favorite superhero (or super villain) and joins forces for the most epic bounce party ever!